A drama "based on Grand Theft Auto" is being made for British TV by the BBC. It's part of the BBC's "Make It Digital" campaign, which hopes to "get the nation truly excited about digital creativity". 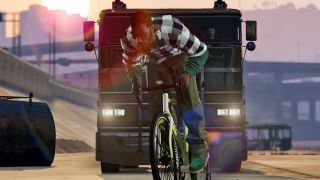 It's being co-developed by games and technology journalist Guy Cocker, who confirms on Twitter that it will be a drama "about the making of GTA", rather than a violent gangland adaptation of GTA's subject matter. The BBC media centre describes it as a "special 90-minute drama" about "a bunch of British gaming geniuses who had known each other since their school days". The show will also dramatise the moral panic that erupted when the game was released, "from parents worried about children immersing themselves in such a violent world; from politicians, alarmed at the values it encourages; and above all from moral-campaigners, who have fought passionately to stop it." No air date yet, or news about whether it'll find its way to international audiences, but we've reached a stage where a respected TV institution is hailing game developers as "geniuses", quite different from the mainstream media treatment games typically receive. Can't be a bad thing, can it?